Many people I know are intimidated by yeast. And with good reason. The whole rising and sometimes second rising thing can seem kind of daunting. But here is the thing you should remember when working with yeast. It does most of the work for you. You just do some mixing, let it sit, and it rises for you. Timing can be tricky, especially if, say, you have two little boys who need wrangling and transporting to and from preschool. But if you think ahead a little bit and plan your rising times, you can be golden. Two nights ago, a high school friend of Randy’s came for dinner. They hadn’t see one another in 20+ years and I, of course, had never met him. When cooking for a stranger, I usually try to make something fairly “normal”. I decided to make calzones. I made them once long long ago, when I was not as good a cook, and found the whole process exhausting. I found this recipe while I was looking for the Gougères recipe in Baking Illustrated and I thought it seemed perfect because who doesn’t like what is essentially pizza? There is the golden rule of entertaining which says you don’t make something new for a dinner party. As I have said here, I don’t subscribe to that rule. My golden rule states that you don’t make something that takes a lot of last minute preparation for a dinner party. When I realized that the calzones had to be assembled and baked right before eating, I told Randy I was going to make pasta instead. He was crestfallen – so I broke my rule. Let me tell you, it is very difficult to carry on a conversation with someone while you are rolling out, filling and crimping 6 calzones, not to mention fighting with the pizza peel and stone and trying to make sure you don’t burn your arm off. All that being said, they were really really good. When I could finally sit down and focus on the conversation and on eating the food rather than preparing it, I was very pleased with the result. The dough was a dream to work with, very easy to roll out, and has the perfect consistency when baked. 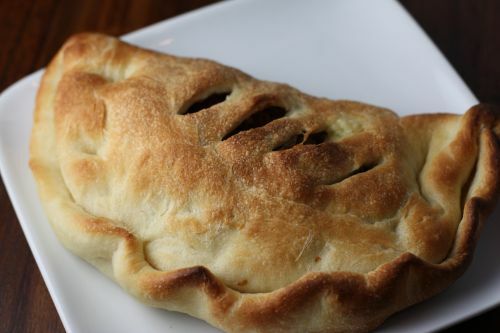 I never order calzones in a restaurant because they seem to be just a cheese bomb. This filling was creamy but not overly cheesy – the perfect balance of mozzarella, ricotta, and Parmesan. I added the optional addition of sausage and broccoli rabe (I used veg sausage) which gave the whole thing a wonderful savory and bitter quality. For my clients last night, I made one of my favorite dinners. I make it every spring because it stars fresh artichokes in a salad where there are also chickpeas and sundried tomatoes. It also has rice/quinoa/corn cakes topped with an intoxicating jalapeño tofu cream and olive tapenade. Because it is fairly light, I decided to make an asparagus soup and a focaccia. 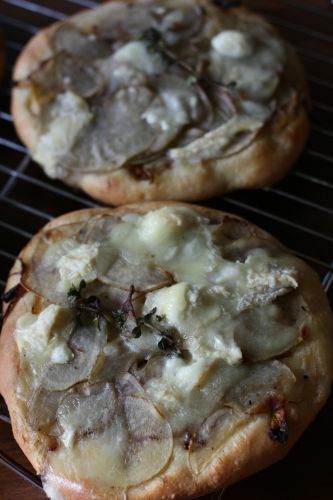 The focaccia I decided on starred caramelized onions, very thinly sliced potatoes, and an intense creamy Brie-like cheese. This dough was also easy to work with and I had high hopes for the result. I have to say, for the work involved (and the pans to wash), these were not such a home run. I would potentially make them again using a different cheese, perhaps a Gorgonzola – the cheese here didn’t add enough zing. 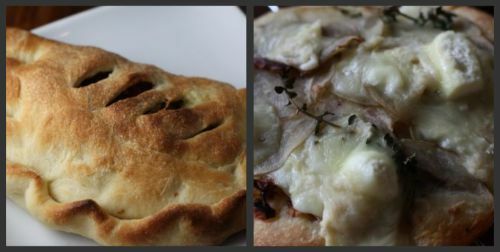 Given the choice between the two, I am going to give you the recipe for the calzones. You will love them, your friends and family will love them. You will be impressed with yourself that you made them. I’m not as sure about the focaccia. 1. For the dough: In the bowl of a standing mixer, whisk the flour, yeast, and salt to combine. Attach the bowl and dough hook to the mixer; with the mixer running at medium-low speed, add the olive oil, then gradually add the water, continuing to mix until the mixture comes together and a smooth, elastic dough forms, about 10 minutes. Lightly spray a large bowl with nonstick cooking spray; form the dough into a ball, transfer it to the bowl, cover the bowl with plastic wrap lightly sprayed with nonstick cooking spray, and let rise in a warm spot until doubled in size, 1 1/2 to 2 hours. 2. For the filling: In a medium bowl, stir together the cheeses, egg yolk, oregano, salt, and black pepper. Cover with plastic wrap and refrigerate until needed. Remove the casings from the sausage (or, if veg, remove sausage from wrapping). Cook the sausage in a 12-inch non-stick skillet over high heat, stirring constantly with a wooden spoon and breaking the sausage into 1/2-inch pieces, until no longer pink, about 4 minutes; stir in the garlic and red pepper flakes and cook until fragrant, about 10 seconds. Stir in the broccoli rabe, 1 tablespoon water, and a pinch of salt. Cook, stirring constantly, until the broccoli rabe is crisp-tender and the water has evaporated, about 4 minutes. Transfer the mixture to a large paper towel lined plate (DT: I used a baking sheet) and cool to room temperature; once cooled, pat it with paper towels to absorb excess moisture. 3. Adjust the oven rack to the lowest position, set a pizza stone on the oven rack, and heat the oven to 500 degrees for at least 30 minutes. Line a baking sheet with parchment paper and spray the parchment lightly with nonstick cooking spray. Turn the risen dough out onto an unfloured work surface. Divide the dough in half, then cut each half into thirds. Gently reshape each piece of dough into a ball. Transfer to the baking sheet and cover with plastic wrap sprayed lightly with nonstick cooking spray. Let the dough rest at least 15 minutes, but no more than 30 minutes. 4. Cut eight 9-inch squares of parchment paper. Working with one piece of dough at a time and keeping the other pieces covered, roll the dough into a 9-inch round. Set the dough round onto a parchment square and cover it with another parchment square; roll out another dough ball, set second dough round on top of first, and cover with parchment square. Repeat to form a stack of 3 dough rounds, covering the top round with a parchment square. Form a second stack of 3 with the remaining dough balls and parchment squares. 5. Remove the top parchment square from the first stack of dough rounds and place the rounds with parchment beneath the work surface; if the dough rounds have shrunk, gently and evenly roll them out again to 9-inch rounds. Place a scant 1/2 cup filling in the center of the bottom half of the dough round. Using a small spatula, spread or pres the filling in an even layer across the bottom half of the dough round, leaving a 1 inch border uncovered. Top with 1/6th of the sausage filling. Fold the top half of the dough over the cheese covered bottom half, leaving a 1/2 inch border of the bottom layer uncovered. With your fingers, lightly press around the silhouette of the filling and out to the edge to lightly seal the dough shut. Beginning at one end of the seam, place your index finger diagonally across the edge and gently pull the bottom layer of the dough over the tip of your index finger; press into the dough to seal. Repeat the process until the calzone is fully sealed. With a very sharp knife, cut 5 slits, about 1 1/2 inches long, diagonally across the top fo the calzone, making sure to cut thorough only the top layer of dough and not completely through the calzone. 6. With a pastry brush, brush the tops and sides of the calzones with olive oil and lightly sprinkle with kosher salt. Trim the excess parchment paper; slide the calzones on the parchment onto a pizza peel or rimless baking sheet, then slide the calzones with parchment onto the hot pizza stone, spacing them apart evenly. Bake until the calzones are golden brown, about 11 minutes; use a pizza peel or rimless baking sheet to remove the calzones with the parchment to a wire rack. Remove the calzones from the parchment, cool 5 minutes,and serve. While the first batch of calzones bakes, form the second batch and and bake them after removing the second batch from the oven. OMG, that just awefuly beautiful Dana. The filling sounds wonderful as I really fancy them; ricotta, brocolli raab, and of corse the sausage. We have the same dinner party rule, but it looks like it was worth breaking here! The calzone filling sounds fantastic. That looks so lovely. 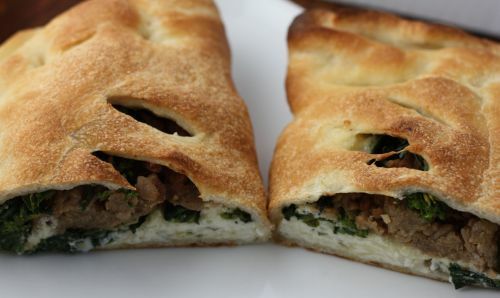 I love the idea of broccoli rabe in a calzone. On a recent trip to LA, I visited Pizzeria Mozza where I had a pizza with broccoli rabe…it was scrumptious. Thanks for the recipe! Your photos are beautiful. And thank you so much for linking to me in your blogroll…I’m going to add you to mine! I was wondering if you could change the link, though–I recently moved to my own domain: http://www.happytummyblog.com. Thanks Dana!